When war broke out in 1914, Alice Yoxon was just 13, the same age as the newly federated nation in which she lived. She was one of many schoolchildren to raise funds for the war effort and later joined the Voluntary Aid Detachment. Her brothers enlisted in the Australian Imperial Force and Alice saved the touching postcards they sent home and also collected war-themed cigarette cards during this period. Alice’s story and the objects she treasured broadly represent the enthusiasm with which some Australians greeted the conflict and their participation in the nation’s war effort. Hers is one of 23 individual wartime accounts displayed in the National Museum of Australia’s exhibition, The Home Front: Australia during the First World War, which presents the personal stories of Australians during the conflict. In 2015, a year when Australian commemorative events are heavily focused on the battlefields of the distant peninsula of Gallipoli, this exhibition offers an intriguing insight into the experience of Australians on the home front during this turbulent period in their nation’s history. The biographical nature of the exhibition explores well-known Australian sporting, cultural, entrepreneurial, medical, and political personalities as well as ordinary Australians, such as Alice Yoxon. Rather than presenting a chronological display, the exhibition takes a refreshing approach to the impact of the war in Australia, focusing the displays on emotions: pride, joy, wonder, passion, and sorrow. It is within these key human sentiments, heightened by the war, that the accounts of individuals’ wartime experiences are explored. Such a layout serves to emphasise the varied experience of those who lived in Australia during the war and to highlight both the destructive and generative nature of the conflict, exploring the profound ways it both inspired Australians and altered their lives. ‘Pride’ captures the enthusiasm and patriotism of the early war years but also some of the complexities with which individuals responded to the call to arms. For instance, the account of a young Robert Menzies, a law student and barrister during the war whose choice, unlike his brothers, to not enlist haunted his political career, represents the decisions and challenges facing Australian men of military age during this period. ‘Joy’ presents the lighter elements of wartime Australia, showcasing the experience of individuals involved in the arts and leisure activities, including a display of May Gibbs’s war-themed drawings of her famous gumnut babies – even they supported and joined Australia’s war effort! ‘Wonder’ considers the innovation of the war years, capturing the work of those who lived in Australia during the war, such as aviator Basil Watson and German entomologist Hans Overbeck who was an internee in camps in New South Wales. 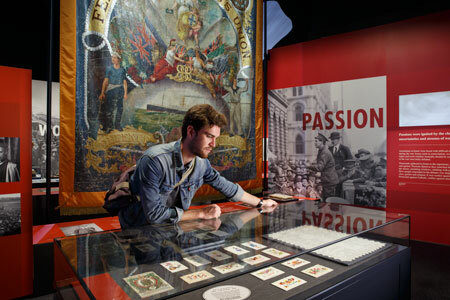 ‘Passion’ is the theme that frames the bitter conscription debates, which sparked one of the most profound social and political rifts in the nascent nation. 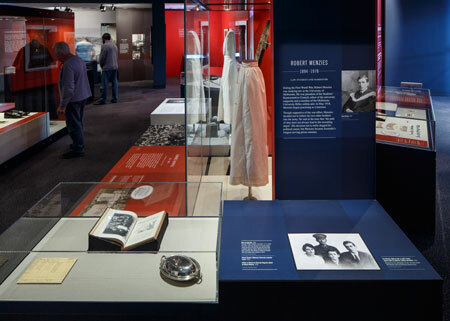 This section of the exhibition displays biographies of some of the key protagonists – Billy Hughes, Daniel Mannix, Adela Pankhurst – whose stories present both sides of the debate. It features fascinating objects and documents, such as the 1917 petition to Hughes for Pankhurst’s release from prison, to accompany these accounts. ‘Sorrow’, the fifth and final theme of the exhibition, presents the effect of the war on those who survived it and on the loved ones of those who did not. Included in this section are several of artist Daryl Lindsay’s medical drawings of facially injured soldiers, presenting the experience of those who suffered the very visible scars of the war. Other stories show the grief and loss that the war brought to Australia. A seamstress from New South Wales, Murial McPhee, carefully sewed garments for her trousseau only to pack them away forever when her fiancée was killed in the war. This exhibition makes use of visual material and digital formats to great effect. Projected on the walls of the exhibition are images from the war and a more detailed look at aspects of wartime life is available through the touch screens scattered throughout the exhibition – for instance, visitors can view the entire Myer spring and summer catalogue for 1915–16 or scroll through photographs from the period. The captions accompanying this material and the range of other objects provide the detail that the biographies and broad introductions to the displays are unable to capture. The great strength of this exhibition is its ability to combine the stories of inspiration and innovation with those of loss and grief, showcasing the diversity of Australians’ experience of the war at home. In doing so, it provides a counterpoint to the commemoration of Australia’s exploits on the battlefield. Given today’s obsession with the Anzac myth or legend which was born on the slopes of Gallipoli and consolidated in the mud of the Western Front, the curators’ attention to personal stories and objects from those individuals and groups who experienced the war from the distance of the home front adds a more nuanced note to the commemorative cacophony of 2015. Notably, the exhibition does not include a biographical story on Charles Bean, Australia’s official war correspondent and later historian of the war, whose writings on Australia’s military involvement at Gallipoli and on the Western Front and establishment of the Australian War Memorial have played such an integral role in shaping many Australians’ ideas about the war and the nation’s involvement in it. 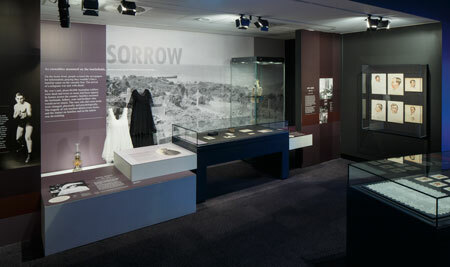 Indeed, the Anzac legend is refreshingly limited in this exhibition, the curators having actively sought to include a range of wartime experiences in the displays, covering stories from Indigenous Australians, women and children and internees, many of whom have been traditionally neglected in the popular narrative of Anzac. However, one of the drawbacks of focusing so exclusively on individual stories and their categorisation within five emotions is the, at times, disjointed nature of the displays. The exhibition lacks a coherent and overarching narrative to tie the experience of the individuals presented into a broader history of Australian society during these years. Consequently, it does not provide the necessary context for some of the profound issues in wartime Australia, including the nation’s patriotic mobilisation and political disputes, and, in doing so, glosses over what was particularly Australian about the experience of individuals at home. 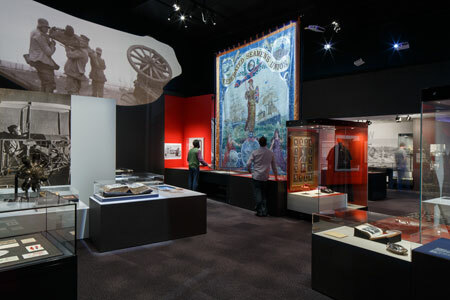 This modest exhibition emphasises Australians’ varied responses to the war and fits with the Museum’s larger project Remembering 1914–18: Objects, Stories and Emotions, which aims to create an interactive online archive of objects and their stories from the Museum’s holdings and to encourage contributions from the public. In this way, Home Front: Australia during the First World War is not simply an exhibition but a part of a broader commemorative practice that will, in years to come, prove a fascinating and invaluable source of material about how Australians have chosen to commemorate the centenary of the First World War. During the celebrations of the ‘A Century of Service’, the Museum’s exhibition reminds us of the other side of Australia’s war story, adding the fresh and varied voices of those whose lives exemplify the diversity of Australians’ wartime experience on the home front.